Over the past year, most investors have been fleeing the sovereign debt of Spain, Italy and other euro-zone basket cases. Not Mr. Corzine. The onetime chief executive of Goldman Sachs and former New Jersey senator and governor who has run MF Global since early 2010, was all in, buying up $6.3 billion worth of discounted euro-zone debt. 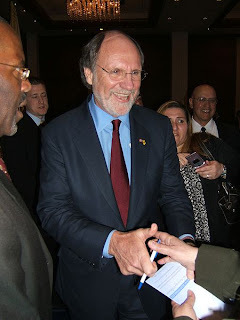 As Azam Ahmed reported in The Times on Tuesday, Mr. Corzine appeared to be wagering that the European Union would come to the rescue of Europe’s troubled economies, averting a default. In other words, Mr. Corzine was betting on a bailout. Apparently they were also dipping into depositors' funds, which is quite illegal. Financiers can never, ever, ever be trusted. Wall Street is different from a casino in that casinos have rules. Imagine if you could raise $10 billion, lever up to $400 billion, take that to the roulette wheel, and distribute the whole around all 38 slots. If you win, you're rich, if you lose, you quick pay yourself $50 million in severance, declare bankruptcy, and walk away. Nice work if you can get it.